Superman has a problem. He suspects Aquaman has turned to steroids. It’s a violation that could get him booted off the Justice League, but Aquaman seems more focused on the high he gets after pumping 1,000-pound weights than being in a superhero club. Superman needs to catch him in the act so he could report it to ‘Roids Anonymous before the Justice League finds out. But even if he does catch him, he knows Aquaman will vehemently deny any wrongdoing. It hails from the genius gadgetry lab of Thanko in Akihabara. 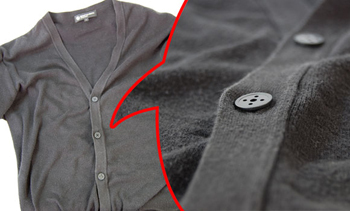 All you have to do is replace it with a button on your shirt and slip a magnetized ring onto your finger. To start recording, casually wave the ring near the button. Do the same to stop recording. Priced at about $60, the spycam can take up to 1 1/2 hours of video at 15 frames per second (4GB internal memory). It weighs only a few ounces, and hides easily behind your shirt to no one’s suspicion. And it comes with an array of button colors — white, pink, and yellow — to match every piece of pastel clothing in your wardrobe. Sleep at a Capsule Hotel! Ever thought about spending a night in a coffin? That’s what most people imagine a ‘capsule’ hotel to be like. Cramped living quarters. Loud-snoring men. Communal baths. None of my friends who’d stayed ever had a particularly good review. “It’s… an experience,” they’d say. Yet, for my most recent trip to Tokyo I found myself intrigued by the idea of sleeping in a room no bigger than myself. At less than $40 a night it’s the most affordable means of getting a good night’s sleep. Akihabara’s Capsule Inn is just a 5-minute walk from the station. Once you’re checked-in, they give you a wristband strapped with two keys: one that will open your personal locker a la Jr. High gym class, and one that will open the room which houses the capsules. It’s a well-planned facility with women lodged on the top three floors and men relegated to the lower five levels. If you catch a man in the upper levels you know he’s up to no good. The capsules themselves have no doors. I assumed there was a translucent air-tight hatch, so for the longest time I stood in front of my bunk trying to find the lever to open it. After realizing I could just jump in, I spotted some wood blinds to pull down for privacy. Inside, it’s surprisingly roomy — with at least 5 inches of space above my head when sitting upright (though I’m tiny). You also get a built-in TV and radio for those restless, jet-lagged nights. The communal bathroom and shower facilities were well-kept and equipped with all the fun stuff like shampoo, soap, combs and hair dryers. And while you’re waiting in line you can surf the net, free of charge.